There has been a recent discussion on the possible differences in force generated by different types of weapons on the SCA rapier field. It became clear that it was necessary to actually test the weapons rather than continue to throw conflicting theories across email. Llwyd remembered that Don Tivar had created a machine for just this purpose. He set about developing a modern version of that machine that could be used to test striking forces for current and proposed weapons. Five versions of the machine followed until the current Mark V model was produced. This site documents the development of various iterations of the machine through the current Mark V model, encourages and provides tips on making your own rigs, and documents and discusses a growing database of rapier-field weapon force data. Please click on the list on the upper right menu to select the topics that interest you or start here. Llwyd joined the SCA in 1990 while in grad school in Atlantia and immediately started fencing. He moved to the Midrealm in 1993 and became an early marshal there. He spent several years in the West Kingdom during the fencing ban and wrote rules proposals that helped restore it. In 1999 he returned to Atlantia. Llwyd has served as a rapier marshal at multiple levels including Baronial, Regional, Principality and Kingdom. He has been the KRM for Atlantia and is currently the Drop Dead Deputy to that office. He has served in many other offices including being the Baron of the Barony of Tir-y-Don. Llwyd was a member of the SCA Rapier Rules Revision committee with primary contributions in the areas of data collection and risk definition. Among other awards, Llwyd has been recognized as a White Scarf and a Pelican and has received a writ to join the Order of Defense. 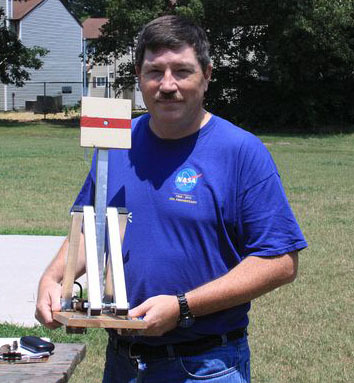 Llwyd received a Ph.D. in Aerospace Engineering from Virginia Tech in 1993. Since that time he has worked primarily for NASA as both a contractor and more recently as a civil servant. His specialty is structural analysis and design which he applies to space launch vehicles and high speed aircraft. He is also frequently called upon to serve as a subject matter expert on composite structures. He was recently profiled for the NASA Langley newsletter. You can read the article here. While the reception and interest in the machine and its data has been very positive from all levels of the rapier marshallate, this is my own project. I am motivated to provide hard data that can be used as a basis for good policy. I, of course, have opinions on what policies should be made based on the data. I have expressed those opinions to the proper officials and included them in the Rules committee report, but am not in a position to make policy myself. I encourage each of you to read my results (and if possible make your own machine to confirm them) and express your thoughts on these subjects to your KRM, KEM, and the SRM and SEM.